I am proud to share why I support Hats Off For Cancer. My Mom was diagnosed with a tumor when I was only 9 months old and had a lot of her hair shaved off for her surgery. As a result, Hats Off is very close to my heart. I am honored to be able to help collect hats for the thousands of children who lose their hair during their cancer treatment and surgery. I am extremely grateful for my health and for being able to pursue my passion of golf. I have also been a Double Red Cell and Platelet Donor for the past two years. Many patients who need platelets are undergoing chemotherapy or organ transplant and have weakened immune systems. A platelet dose from a single donor reduces the patient’s exposure to multiple donors and is therefore preferred by many physicians. A single platelet donation can provide enough platelets for a full therapeutic dose for a patient in need. In fact, some platelet donations yield enough platelets for two or three therapeutic doses. By contrast, it takes four to six whole blood donations to produce a single therapeutic dose. My monthly platelet donation takes a full 2 hours. Knowing I can affect someone’s life in a huge way, through platelet donations and through my work with Hats Off For Cancer, means a lot to me. Through golf and the events I play in, I have made wonderful connections in the sporting industry and am happy to have received the support from companies like Adidas and Taylormade to name a few. I am looking forward to Mad Hatter Day 2011 and collecting over 1000 hats myself! Tyler is the first and only Junior Board Member for the international nonprofit program, Hats Off For Cancer. He has participated and organized several hat drives and is responsible for spearheading the Portland area’s Hats Off For Cancer’s National Mad Hatter Day Event for two consecutive years now. His first effort found him as the national award winner for the most hats and monies donated. This is not an easy achievement as there were over 100 hat projects nationally entered in the Mad Hatter Day event. He was also featured on the Hats Off website as the national award winner with a photo and story about his very special event. His commitment continued and was so impressive to the HOC Board of Directors, that they invited him to hold the position of the very first Junior Board member to be named on this nonprofit board. Tyler started playing golf in his freshman year of high school and his leadership and personable skills earned him the role of captain of the Varsity team in his Junior and Senior Year. After only 6 years of golf, he has since gone on to play on the International Junior Golf Tour. 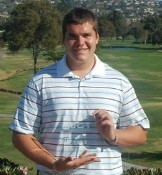 After qualifying for the IGJT Tournament of Champions in Florida in May of 2011, Tyler was selected to play for the IJGT Team USA against Scotland and Canada in St Andrews, Scotland, in the Euro Cup in July 2011. Sharing the same birthplace as famous South African golfers such as Bobby Locke, Gary Player, Ernie Els, Retief Goosen and Louis Oosthuizen, Tyler hopes to emulate their success on the national playing field. Tyler continues to use his sport to connect with Nike, Adidas, Taylormade, Quicksilver as well as DC Shoes, to encourage them to donate hats to Hats off for Cancer.